What do you really wish you had? omg! how cute! what's his mix? my dream dog. 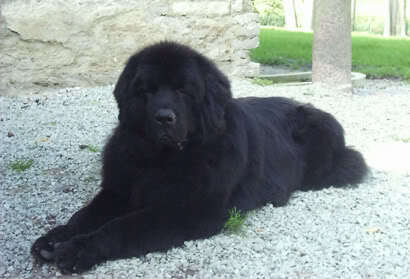 newfoundland or "newfie"
someday soon my love, soon. I don't think a million dollar home now a days is very big. A pup from this breeding. This breeding is from Hawaii. I wanted to bring one in, but Aileen won't make me bring in any more dogs until I graduate. wow, he looks fierce! what's this breed? i think you need to get a ranch for all the dogs you want to keep. Hahaha!!! Thats kinda the plan. Me and Aileen plan on renting a house from my mom for a few years and save up for at least a half acre land to build our house on and a 8 stall kennel kennel system. These dogs aren't only our business, but they also give a way to releive our stress. These are the new types of American Pit Bull Terriers. Their fighting line has been bred out of them and they have been bred to look more impressive than the original APBTs. We are working to get them their own title as "American Bullies". These particular two are the smallest of that category; "Pocket Pits". They stand no taller than 13 inches high fully grown. awww boots, you will! in about 4 years! aidan was pretty good sleeping on his own in the beginning and so will kaia...soon!